What Can the Library Do for Me? 8:30 a.m. to 11 a.m.
Get help finding articles, books, and credible websites for your research assignments. Get help creating your reference list in NoodleTools. Library staff will show you how to use this great tool to generate your reference list. The library has several guides & tutorials to help you with research, writing, and other course work. 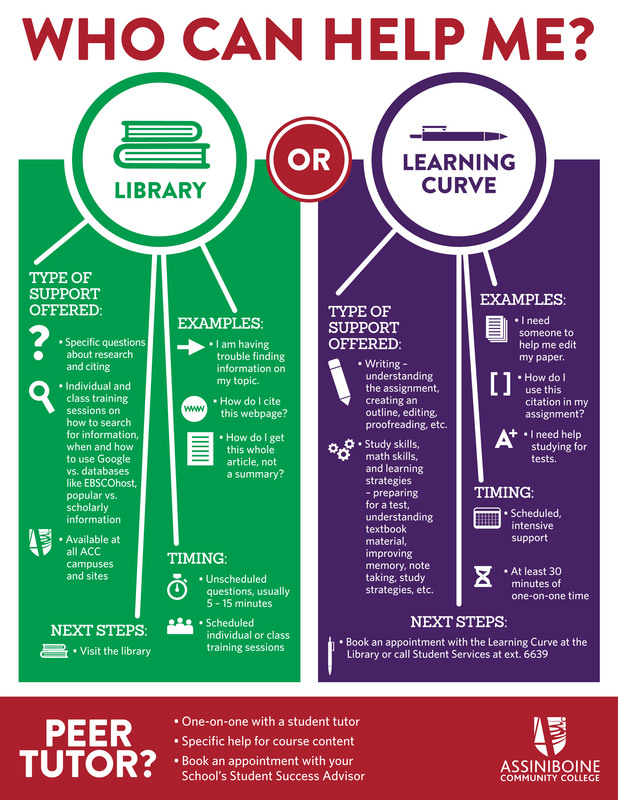 Sometimes it's hard to know if the Library or the Learning Curve is the place to get help. Use this diagram to guide you. Borrowing books from the ACC Library is simple! Your student card is your library card. Simply present your library card at the front counter with your books. Do you have an item that's overdue? Don't fret! There are no fines for overdue materials. Notices are sent out to students to encourage prompt return of materials. If you don't return materials after six weeks, you'll be billed for the replacement cost. Fill out this form to request a book or full text article from another library through us. ACC students have the opportunity to use the Brandon University Library and its books. Certain restrictions may apply. In order to borrow Brandon University library materials, you must present your ACC student card. Find books in libraries across North America.